Ovarian cancer is the fifth leading cause of female death globally due to its low survival rates. Thus, improved approaches for ovarian cancer detection are urgently needed. MicroRNAs as a new class of biomarkers have been explored in recent studies. This study was trying to identify and validate the two kinds of serum microRNA (miR-200c and miR-141) as biomarkers for ovarian cancer. We extracted serum samples from 74 epithelial ovarian cancer patients, 19 borderline ovarian cancer, and 50 healthy controls. Relative expression of these miRNA markers were measured by quantificational real-time polymerase chain reaction assay (qRT-PCR). Receiver operating characteristics (ROC) and area under the ROC curve (AUC) were used to validate the diagnostic value of miR-200c and miR-141. Kaplan-Meier curve and the log-rank test were conducted to detect the prognostic value of miR-200c and miR-141. miR-200c and miR-141 were significantly elevated in the epithelial ovarian cancer patients compared to healthy controls. The relative expression level of miR-200c showed a descending trend from early stages to advanced stages, while the level of miR-141 displayed an escalating trend. Patients with high miR-200c level achieved significantly a higher 2-year survival rate compared with the other group (P < 0.001), while low miR-141 group showed a significantly higher survival rate. 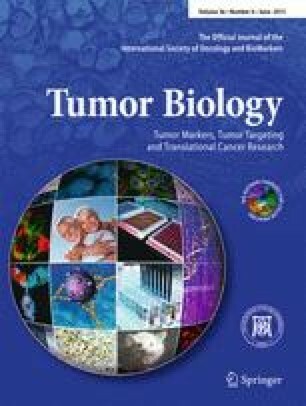 The results of the current study suggested that serum miR-200c and miR-141 were able to discriminate the ovarian cancer patients from healthy controls. In addition, miR-200c and miR-141 may be predictive biomarkers for ovarian cancer prognosis. Further large-scale studies are still needed to confirm our findings.